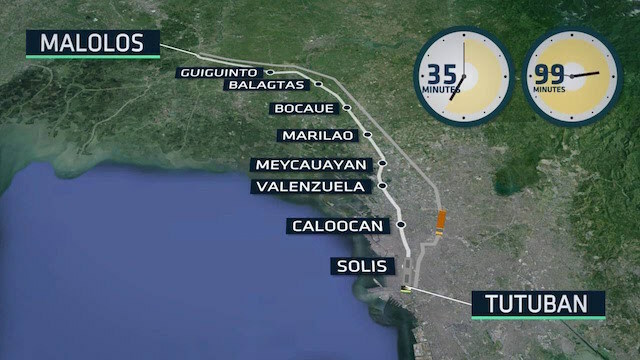 A 38-kilometer railway transport connecting Tutuban in Manila to Malolos, Bulacan expected to cut travel time to just 35 minutes is expected to be built in 2019 and target launch between 2021 and 2022. Detailed engineering design is already ongoing and expected to finish with this year after a feasibility study has been concluded in the North-South Commuter Railway project, according to Mikaela Mendoza, project development officer at the Department of Transportation. The railway line, funded by a $1.99 billion loan deal between the Philippines and Japan in 2015, offers a faster link between National Capital Region and Central Luzon, and is expected to accommodate 200,000 passengers a day. It will run across 10 elevated stations, and will have 13 train sets with 8 cars that can carry 2,238 passengers per train. Once launched, a trip from Malolos to Tutuban is expected to take only 35 minutes, even during rush hour. The trains will provide commuters reliable and punctual transit, with a headway of 6 minutes between trains. Eco-friendly features as well as passenger safety in an event of an earthquake are also integrated into the design. During the construction phase of the project, the old stations of the Philippine National Railways, such as those in Malolos, Balagtas, and Meycauayan, will be preserved.